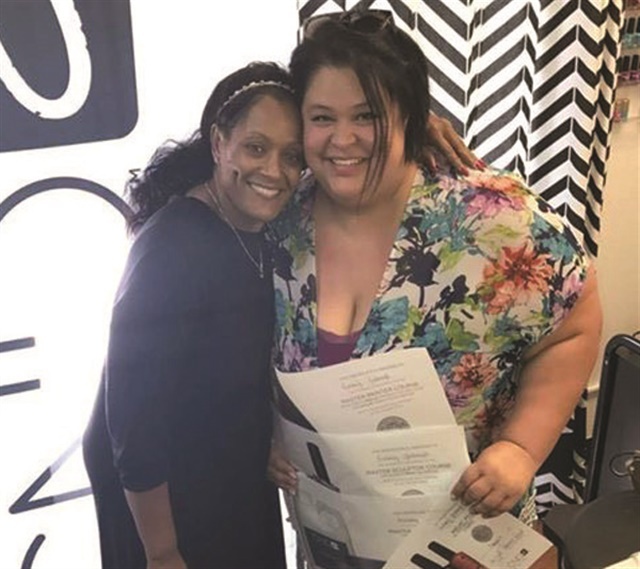 Since receiving a Beauty Changes Lives CND Advanced Scholarship in 2017, Little Rock, Ark.-based nail tech Kim Forga-Yarbrough (@kimyarbrough_cnd) has seen her career blossom. This former “kitchen-table” manicurist took the opportunity to become a CND Grand Master, upping her skills, mentoring others, and even discovering a surprising connection to a biological family she hadn’t met before. Were you surprised to win a Beauty Changes Lives scholarship? Kim Forga-Yarbrough: The real surprise was finding out how my passion for nails was shared by my birthmother — a person I sought to locate for more than 30 years. Winning the scholarship renewed my curiosity about my biological family. When I finally found my birthmother in Canada, I learned that she is a nail professional and we come from a long line of nail supply store owners. Did you always want to pursue nails as a career? KFY: I was a competitive artist as a child and did some illustrating work. But life is busy. I am a mom of eight children and have been married for 20 years. When I was laid off from my job at a dental office, I ended up being a “mom/nail professional” which provided the flexibility I needed along with extra income. I started out doing what I call “kitchen nails”— using my home’s kitchen as my nail shop. But I found that clients didn’t take the business seriously or respect me as a professional when I worked from home. That drove me to invest in my career and explore the CND scholarship. How did winning the scholarship help your nail career? KFY: It helped me carve out a unique point of differentiation as a CND Grand Master. It also changed my philosophy about the role of the nail professional. I used to be fascinated by nail art and enhancements, but since then I’ve built a client list that is interested in natural nails, and have expanded by offering men’s services. What advice do you offer other nail professionals? KFY: There is a lot of talk about social media, but don’t forget the simple business card. Believe it or not, some of my clients are not on social media. And they also share my cards with their friends. Also, take photos of clients’ nails before and after. I’ve used this technique to help market gel nails to men. They can quickly see how a subtle gel nail can still look natural, but even better! How are you paying your success forward? KFY: I just started mentoring as part of an e-learning program with a local high school. The course I teach, Principles of Business and Microeconomics of Cosmetology, is part of the school’s cosmetology program. KFY: When I get on a plane to teach a class for CND or another brand, I will know I have truly made it! And of course, when I continue the family legacy and open a nail salon with my daughters.